Warning :the method presented in this article are too old to be applied now. Use this information at your own risk. But ! if you want to configure a Wacom from command line , you can find here precious informations, that's why I don't archive this guide yet. Here are my notes, to transform a Linux Mint 11 Katya fresh install into my ideal production-ready machine on my studio, with all apps I need. I tried to write it with details for almost Linux beginner. Also straight forward, most actions are condensed to be 1 lines copy/pasting. I 'll keep this config for a long time. Mostly new solution can't fill half of my needs. A reason more to publish my note and share my treasure. 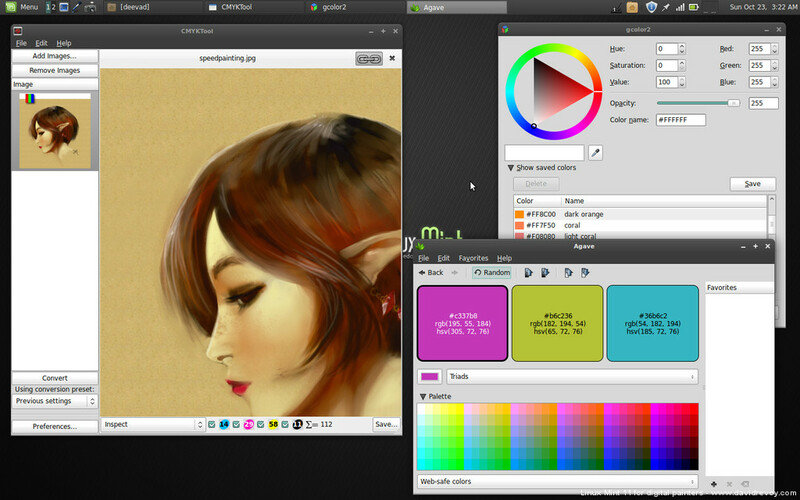 Note : all was tested and written for Linux Mint 11 main Gnome edition. please don't comment if it's not working in another release, and do it at your own risk. Note : if you have a Gfx card, Install proprietary driver , a pop-up propose the installation of restrited driver at startup of a fresh install , follow instruction , then reboot. Note 2 : To use the code here , open a terminal ( Menu > terminal ) then copy paste this each line by each line ( with Ctrl + C to copy the selected line but Ctrl+Maj+V to paste in a terminal ; or the auto method : select the line with 3 mouse click and paste directly with one mouse wheel click -simplier- ) confirm when needed with typing 'y' then enter, or type your password when asked. Log-out , at login screen, click on your name, then in the menu who appear under choose Gnome ( No effects ) ( menu on the bottom of the screen ) , then log in with your password. 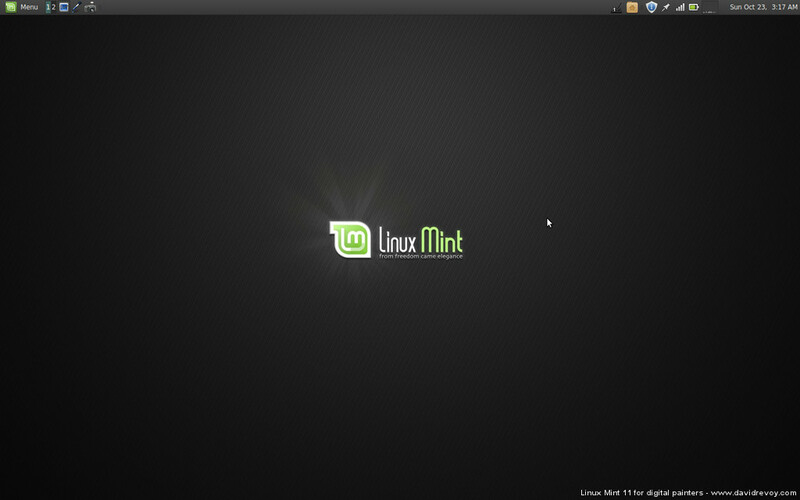 Linux Mint 11 comes with all the bugs of Ubuntu 11.04 Natty Narval . 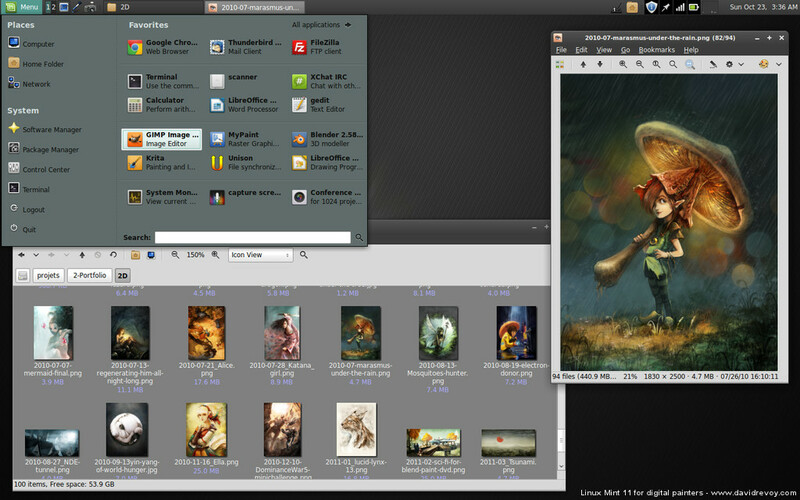 Bugs makes Compiz laggy ( effect for windows manager ) , problems for 3D programs and tablet. • open Menu > Package Manager ( Synaptic ) , in the quick filter , type 'xserver-xorg-core', click on the package, then go to the menu 'package' and activate 'Lock version'. then to not make future Gimp update overwrite your Gimp-painter, open Menu > Package Manager ( Synaptic ) , in the quick filter , type 'gimp', click on the package, then go to the menu 'package' and activate 'Lock version'. Note : Thanks Shaun Perryman for this second PPa link on the comment. Note: for usage after install , just open or save *.ora files as you would do with other type of file in Gimp. ◕ 4 to 5GB diskspace needed. Lcms2 : Krita switched totally to the library liblcms2 - faster, more stable, etc... but not provided by defaullt Linux Mint 11 package. So, to get it, you will need to compile Lcms2, newer distribution don't need it. • then log out your system , and re login. 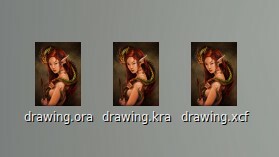 Krita should launch if you click with your file explorer ( nautilus ) on the "/home/<yourusername>/source-to-compile/calligra/calligra-inst/bin/krita" icon. launch systemsettings ( Alt+F2 , then type it , then enter ) and go into 'Application Apparence' for advanced config ( color, icon size, icon style , more UI colors ) . Just remember their is overlap of features between qtconfig and systemsettings , but even if qtconfig have less option, it will have last word. Press ok , now Krita is in your applications. Press ok , now Gimp last dev is in your applications. Note : at each 'build' ( when you launch the script ) you will be updated. Also a new version ( folder ) will appear under your /opt/gimp folder. Think to clean it a bit sometime of old builds ( right click on /opt/gimp-razor/ , open as administrator , then delete old builds with 'suppr' on the keyboard ... Read the number of build like this : year - month - day - hour - minute - seconde ... ex : 2011-10-21-14-13-55 , for now I edit this article ). 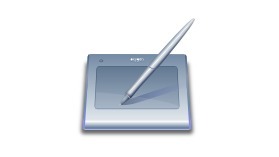 • In a nut-shell : to configure your Wacom at each start-up, you will have to write a script. This *.sh script will be a series of 'xsetwacom' lines to setup and customise your tablet. xsetwacom set "Wacom Intuos4 6x9 pad" Button 2 "key f12"
xsetwacom set "Wacom Intuos4 6x9 pad" Button 3 "key x"
xsetwacom set "Wacom Intuos4 6x9 pad" Button 4 "key m"
xsetwacom set "Wacom Intuos4 6x9 pad" Button 5 "key ctrl z"
xsetwacom set "Wacom Intuos4 6x9 pad" Button 1 "key e"
xsetwacom set "Wacom Intuos4 6x9 pad" Button 6 "key ctrl"
xsetwacom set "Wacom Intuos4 6x9 pad" Button 7 "key c"
xsetwacom set "Wacom Intuos4 6x9 pad" Button 8 "key w"
xsetwacom set "Wacom Intuos4 6x9 pad" Button 9 "Key shift"
xsetwacom set "Wacom Intuos4 6x9 stylus" button 2 "key Control"
Use the Mint Menu > Preference > Startup Application and link there your script. button 1 = tip ( part to draw ) , button 2 = first button ( next the tip ) , button 3 = second button. "40 0 100 80" is my preset is for a "hard"
• Cintiqs behaves like a simple tablet over a screen ( intuos3 or intuos4 depending of the model ) , for both recognitions of hardware it's usually ok but for more information about supported hardware read the official wiki : http://www.linuxwacom.sourceforge.net ). Note 2 : replace the 'device' with your device name, if you don't know it read the start of this Wacom part again. xinput_calibrator --device "Wacom Cintiq 21UX stylus"
Click the red 'target' with your stylus , be precise , try to adopt at this moment your default position in front the Cintiq . • Launch your script made with your xsetwacom parameters, and test if the calibration is ok. You can redo it if necessary. xsetwacom set "Wacom Cintiq 21UX stylus" MapToOutput "HEAD-0"
xsetwacom set "Wacom Cintiq 21UX cursor" MapToOutput "HEAD-0"
xsetwacom set "Wacom Cintiq 21UX eraser" MapToOutput "HEAD-0"
xsetwacom set "Wacom Cintiq 21UX pad" MapToOutput "HEAD-0"
Note : "HEAD-0" can be "HEAD-1" etc... depending on your screen disposition, just test the value who does the right job. switch to faenza icon theme : right-click on desktop , then 'Change desktop background', then 'theme' , 'customise', 'Icons' , select Faenza. Save it, right-click on desktop wallpaper , then 'Change desktop background' , then setup it. You need to logout, then login to see the result. 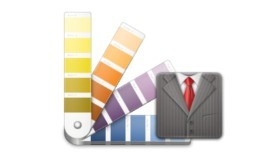 Color : customise 'selected items' with your favorite color. If you find a better way to install things , or shorter , please share in the comment. I tested all of this so many time, but I'm not protected against a typo, or a mistake. Help me to improve. If you want to do a similar guide for your distribution, please do it, more documentation, more freedom for digital painters. If this made you win times , and make you enjoy your Linux Mint 11 system ; share it ! License: CC-BY David Revoy, www.davidrevoy.com, 22 october 2011 . Woah, this is phenomenal! Thank you! I have to say this David... I love you... lol, you are the best!!! no words, tomorrow I will share this. Thanks for your time and organization, I have no words. Hey David, why you did not make a whole team of developers, or just you, and create a distro or just a live cd? 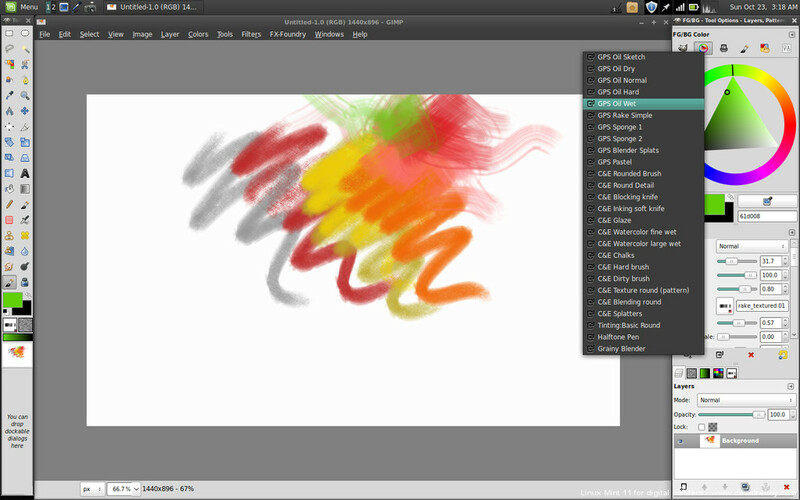 something like ubuntu studio, but for painters. I think this can be a good idea, you have a good understanding of scripting, etc. David... thank you for this. If i could make my cintiq run properly under Linux i would switch RIGHT NOW. Alas, not yet. C'est vraiment très généreux de votre part de nous faire partager tout ça. Un grand merci à vous ! Maintenant je vais tester tout ça ! Merci beaucoup pour tes retours d'expériences du monde libre. Et encore, bravo pour tout ton travail. What does this do? Makes it less sensitive? Why? this post really helpful especially about gimp-razor.Thanks to Stéphane R. Richard, who made that awesome code. Anyway David, i agree with Giovanny Arce, but it's not only 'you', how about 'we' make distro for floss digital artist. It would be awesome to rejoin with other who has same passion. Hey thanks & merci all for the feedback. 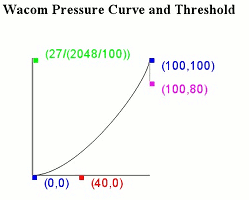 I updated the page with the infos asked by anonymous about the PressureCurve option. I might continue to update this page in the future with other tips. My curve don't make the device less sensitive, it makes a bigger contrast in the range between low pressure and hard pressure ; with this I'm better able to manage around 6 strokes with only varying the pressure of my stylus. Making a new Linux CD distribution with good setting from the scratch sound a good project, but surely out of my capacity and personal target. As many of you, my main passion is to paint but also to transmit my passion of painting . The systems is just a tools, and gathering this infos as above is a real pain to be true when doing it alone , and I learned it the hard way ; tested so many different things with deceptions. For the moment, I'm satisfied if a guide like this can offer a way to skip those painfull moment for a more beginner, or a casual Linux user. By the way, I hope the content of this page will attract attention to someone who want to merge them as default in a distribution as Ubuntu Studio would be a perfect place to got most of those things already present inside the DVD. David, you made it run with the cintiq? I am migrating now, for real! After reading this I had the same idea of Giovanny Arce. If there was a Susestudio for Debian/Ubuntu it would be much easier. 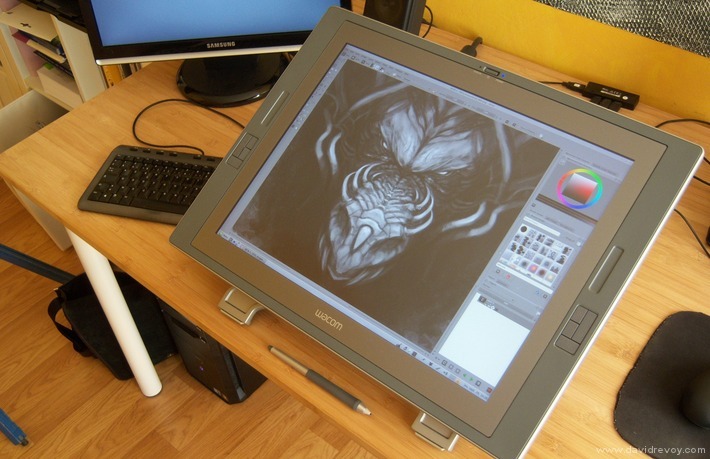 @Juan Ochoa : yes, I do as I own one :) I updated the article for you with my Cintiq setup ( and added a photo ). Good luck in your switching ; take time and patience, and you 'll get the result you want. @Andre : I use the default. You surely have a specific hardware issue related with 11.04 ( and so Lm11 distribution ). Hope you'll find a solution on this pages : http://www.google.com/search?q=+site:ubuntuforums.org+slow+boot+11.04 ; good luck. @Shaun Perryman : Thanks ! I updated the article. Thanks for another very helpful post! I notice that you include Inkscape and I was wondering if you (or anybody else, for that matter) are able to get pressure sensitivity with your tablet in Inkscape when using the Calligraphy tool? I haven't been able to do it under Linux Mint 11. Thanks! Your blog and tutorials have been an incredible resource for those of us brave enough to forge ahead with Linux and open source. Thank you so much for this latest comprehensive guide. I was already doing quite well using Mypaint and your workflow from before. This guide puts all of the pieces together and helped me get even further. Compared to all of those Photoshop/SAI users, I no longer feel like my choice of tools is holding me back. Now I can forge ahead and improve without the fear of having "inferior" tools. I can't thank you enough! I need a bit of time to read all carefully. but thanks a lot for your HARD work. amazing. @Jayraj Kharvadi : Feel free to post a little comment on Zanshine's blog ( http://blog.zanshine.com/blog/stephane-richard/2011-05-10/cutting-edge-gimp-in-latest-ubuntu/ ) he has all the merit and effort for writting this script. I'm just a one who pressed a sort of 'share' button with reposting it a bit modified, with easier instructions. 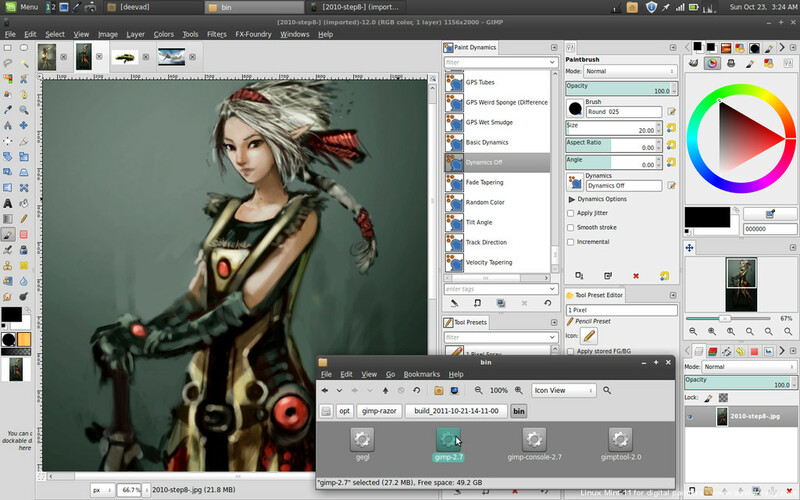 @icius : Thx, and yep after all those years of switching from windows into this obscure Linux, with Krita 2.4 / Gimp 2.8 and Mypaint 1.0 soon , I feel like a new area will open for digital painters. Also the future 3.4 gnome wacom panel ( version 3.2 have basic function) and fix around Ubuntus and Gnome 3 ( for next LTS ) will make a good mix for sure. @Ramon Miranda : Thx ! that was huge to post it indeed. I also did it for every of my 'students' , the one of my DVD's and the one of todays and this week workshop. Thanks my blog system to finally got WYSIWYG. Before that I was writing all in pure html , and it was impossible to make complex guide without headach of html tags. Hey David, thanks for the reply. I probably should have mentioned that I've tried all of that to no avail. I've actually used Inkscape for years and haven't ever had this problem before, namely that no matter what I do or enable, pressure just doesn't work. It's frustrating, as Inkscape is my favorite drawing program. But since it works for you, maybe I'll back up my work files and try a fresh install and see what happens. Thanks again. Bonjour David et un grand merci pour ce tuto très complet. J'ai suivi à la lettre ta procédure sur une machine Virtualbox et j'ai relevé 2 petits problèmes qui pourraient égarer certains lecteurs peu portés sur la ligne de commande. C'est bien peu de choses en regard de la maestria de l'ensemble. @Andre : I did my admin cleaning job as you requested , thanks for the PPA link btw. hi david, i saw you yestarday at viewconference in turin, and after your workshop i had try to pass on linux, but i still got some problem whit mypaint :(. I've almost completed the installation. I need to configure the monitor and the tablet. I've noticed that AlchemyOpenGL version freezes my desktop (but Alchemy without OpenGL is ok). Also "Compiz fusion icon" doesn't start. I used it to turn off/turn on compiz. And I use Nvidia drivers. @Andrez : Oh, thanks to was on workshop ! for Mypaint try to go on your /home/*username* folder and look for the '.mypaint' folder ( Ctrl + H ) to hide or unhide preference files. You have an error in the preference. You can delete this folder '.mypaint' without risk if you don't made custom brush or got some preferences you want to save. 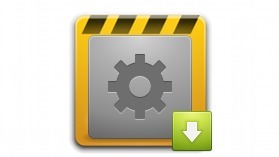 Mypaint at launch will rebuild this folder with default settings. Hope it will work. @Marco : Good to finished almost the install. Don't hesitate if you find something to improve this guide. For Compiz icon, yup, compiz stuff is pretty working weirdly , I didn't tryied AlchemyOpenGL and I learn with your message about his existance. The fact most of the Alchemy features were ported into Krita makes me prefer to use this last one. But I will spend a look and good to know the tips. Maybe this bug is to report to the Alchemy dev team by the way. Probably is more a problem of this version of Compiz. Since AlchemyOpenGL works on Natty and in previous versions. Right now my problem is that I can't rotate the screen with xrandr. I'm googling and it looks like a xorg-server bug that has been fixed. Also when I maximize a window it takes the two monitors, while Ubuntu Natty wax maximizing only in the screen I was at the moment. Maybe if I install a newer version of xorg-server I solve both problems, but maybe I see other bugs like I had in Gimp. @Marco : If you experience this problems, yep , updating might be a good choice. If it's not working, you still have on this page the code lines to downgrade all to a fixed version. Good luck for it. ok AlchemyOpenGL works if I set no effects. I don't know what is the advantage of the OpenGL version, maybe having less lag with the brush? Though the standard version works fine. If mirror works on Krita I think is enough and I don't need alchemy. At the end I think I won't use compiz. It creates too many problems especially with graphic programs. Though I'll miss some plugins. I still have the problem with dual monitor. I upgraded xorg-server then downgraded again. The only advantage was that I could rotate the screen...but Krita wasn't working with the tablet so I downgraded. It is to make trees, probably you already know it. Also I use a lot Shotwell. I download a lot of pictures that can be good for inspiration and I multi-tag them. For example I press the tag bw and I see all the pictures that I have in black and white. It's excellent because is fast and works with huge archives. Well it's a default program in Ubuntu so probably it's not big news. Then Gnome-do, really useful to open programs really fast pressing Super+Space instead of using a menu. When I draw I go in preferences -> Windows and I choose "Select Windows when the mouse when the mouse moves over them"
So I don't need to get the focus, with the pen can be annoying. I have a script for the OLED screens on the intuos4 and it is placed in /etc/rc.local. So it starts automatically. xsetwacom set "Wacom Intuos4 6x9 pad" AbsWheelDown "key plus"
xsetwacom set "Wacom Intuos4 6x9 pad" Button 1 "key 1"
xsetwacom set "Wacom Intuos4 6x9 pad" AbsWheelUp "key minus"
xsetwacom set 'Wacom Intuos4 6x9 pad' Button 2 "key CTRL z"
xsetwacom set 'Wacom Intuos4 6x9 pad' Button 3 "key CTRL y"
xsetwacom set "Wacom Intuos4 6x9 pad" Button 8 "key Delete"
xsetwacom set 'Wacom Intuos4 6x9 pad' Button 9 "key 6"
xsetwacom set 'Wacom Intuos4 6x9 pad' Button 10 "key 5"
xsetwacom set 'Wacom Intuos4 6x9 pad' Button 11 "key SHIFT"
xsetwacom set 'Wacom Intuos4 6x9 pad' Button 12 "key ALT"
xsetwacom set 'Wacom Intuos4 6x9 pad' Button 13 "key CTRL"
xsetwacom set 'Wacom Intuos4 6x9 stylus' Button 3 "key ALT up"
xsetwacom set 'Wacom Intuos4 6x9 stylus' Button 2 "key ALT down"
The last line has a 0.5 value if I'm in dual screen, so the graphic tablet will work only on the left screen, because if can work on both you have to use half of the tablet for the left monitor and half for the right, which is not very nice to use. If I want to use only 1 monitor I run the script rotate2 where the value is 1. I used xrandr to rotate the screen in portrait mode pressing a button on the keyboard, but here on Mint I can't make xrandr work. Btw the bindings were created inside Compiz Config Manage -> Commands (it's a nice gui for bindings if you hate writing scripts). If you use compiz and you don't want the close button on the gimp's tool bar or to be able to resize it (like it is on photoshop) you can go in Window Rules and press on the + near Non resizable Windows and Non closable Windows then Grab and select the toolbar. Widget Windows. If there is a program that you want to see as widget, can be whatever program you want, just go in Widget Windows, click on + and then grab...click on the program. The last one I think is a useful Compiz plugin is Grid. As keys I use CTRL+ALT+ numbers on the numpad. They let you move the windows as they were like on a grid. For example CTRL+ALT+numpad 7 you get the windows in the top left corner. CTRL+ALT+numpad4 it's half screen on the left. On the intuos4 pen I use the button up and down to increase and decrease the brush. button 5 for the grid and the rest is quite obvious. I think that's it, nothing else comes to my mind. I had the time to try to use it, I'm quite happy, even if I can maximize a window in a dual screen. Yesterday I don't know why but I had KDE4 and Knotify4 at 100% all the time, but today doesn't happen. usually I copy my .gimp-2.6 and other config files inside Dropbox. and I open Gimp to check if everything is ok. So if I have to re-install or install on another computer I have all my settings back in a few seconds. David, finally i read all the info, and i am very happy with all the changes that i have done on my PC. i installed Faenza Icons, better for artists, non distractive look. And install also the ORA XCF and KRA preview thumbnailer, really good change. Also i have improved the Nautilus thumbnails .No more "white border" but "nice shadow". Now i am investigating Wacom stuff. to map my buttons on my Intuos 4 S.
While it is an aside I would also recommend that people install the Plug-in Registry for GIMP. While it may not apply to digital painting, they do expand GIMP & GIMP-Painter in very good ways that may apply to a production digital artist. In production anything that simplifies a task or effect is of value. It is part of the standard Ubuntu Universe Repository and should be available by default on all Mint and Ubuntu based systems. I wonder also, if the extra Wacom configurations you mention will 1: Work with a Bamboo Fun CTE-650 or not 2: is it any advantage over the auto-configuration that I get right now with Mint at work and Ubuntu Studio at home where it seems to be 100% functional just plugged in? I am probably missing something important. I am rather new at this. Additionally you have been a great inspiration and teacher for me. Your tutorials, DVDs, and just examining your work and learning your work-flow has enabled me to expand my skills and abilities by light-years in just the path month. In fact prior to a month ago, I was just a 3D Artist and had never really trained or done 2d work both by hand nor digitally. You have been, in effect, a mentor for me during this past month and I have achieved things I never thought I could do with no limit or end to growth in sight. So thank you, for sharing your work with the community. @Marco : Here too at the end I don't use Compiz. Too much issue for little effect and ergonomy trick not worse it for the moment. Thanks for sharing more tips ! I like the one with dropbox to share .gimp2-6 preferences between multiple computers. @Nathaniel Schultz : Plug-in Registry for GIMP is already in the line to install Gimp-painter from ppa :) I also like it a lot. For the tablet , you're right, most of the time it's fully functional without any installation. What I do here is just xsetwacom lines to customise how behaves button. One of my favorite customisation is to put 'Ctrl' on the stylus button , to pick color with it. So it depend of taste. I don't know if you want to add this but the update from LibreOffice 3.3.X to 3.4.3 is worth it. You have to uninstall the old LOffice first. @Andre : Thanks to add it on the comment ; but I try here to keep focused on digital painting tools to not expand to much the post .By the way , Libreoffice Draw is pretty usefull, as a speed Desktop publishing RGB for PDF presentations ; and all my administrative task ( table / writer ) use it . I will have a look at it for sure and try to install. If it's pretty straitght forward and possible to reduce it as a 1 line update, I will add it fore sure. Et ça me refait le coup à chaque fois... Une solution ? Sinon comment je désinstalle le tout ? @Blork : Hey Blork ; Krita à l'air bien installer, et ça n'a pas l'air d'être une erreur de ta part ; mais une erreur de Krita. Cas n°1 : Attends demain et relance le script pour mettre à jour Krita. Si ça tombe, ce soir il y a 'une bétise' de fait sur le code principal. Hello. Has anyone successfully configure multiple stylus in Linux? I would like to be able to switch between my Wacom airbrush with wheel and the grip pen. I have spent almost 7 hours trying to setup the airbrush, but Linux does not recognize the tool. Any suggestions would be appreciated. Thank you! For multiple input as multiple pen , the driver is not adapted for the moment ( it was by the past ). It's planed normally to have this feature back in future. For more informations , bug report and discuss with the linuxwacom project team. Thank you for answering my question, David. I hope the team will reactivate this feature soon. I will just have to work around the issue for now. I, also, want to let you know that your art is incredible. I am always inspired by your work. Thank you for posting the fantastic tutorials, too! Man.. I cannot thank you enough for this. I just setup my cintiq off my laptop with your help and it's working incredibly well! thank you! thank you! thank you! thank you! thank you! thank you! thank you! thank you! thank you! thank you! thank you! thank you! thank you! thank you! thank you! thank you! thank you! nk you! thank you! thank you! thank you! thank you! thank you! What makes Mint so great that you chose it over other OpenSource OS? 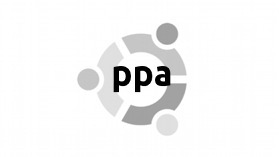 Why you don't use Ubuntu or Fedora? I'm struggling with Ubuntu 10.10. Trying to get Intuos4 L working. It seems that I don't understand the way this OS works. For me it would be easy to return to Windows or buy a Mac and happily use my Wacom pad without problems. But I really don't like Windows and Macs are overpriced. Also I feel sad that as an artist I'm spending so much time in studying how I can configure my Wacom drivers. I would rather just use my time in painting or sculpturing, doing those things I like. But as known, there is no such things as free lunches. In Linux case you will have to work and study hard to get something work right but you will get it without money. In Windows and Mac case you will have to pay to get working things but you don't have to deal with hacking. @Jason : It sames other Linux distribution are not affected by this, only Ubuntu based as far as I understood from a talk on the mailing list with Krita devs. @Tom Wright : Many thanks for your feedback ! nice to know it worked for you. Cintiq makes me got white hair to find the way to calibrate and run it with dual screen. I'm happy my guide can help other to not have to test many random things before succeed on a result. Thanks ! @Andre :Yep, I'm also exited by the wise solution Linux Mint team take for the 12 ; I think I will be able to work on that. 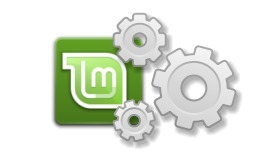 It also seam the Linux Mint community is growing more and more. @Konstantin : My choice for Mint maybe deserve a new blog post to can answer fully. So stay tuned, I will blog post about it for sure next times. Intuos4 is normally plug and play since Karmic Koala ; so 10.10 should be working ok. Customisation via xsetwacom is may be difficult at first , but learn how to manage the tablet independently on the long term, so it 's good. Also, new graphic user interface exist on KDE for Wacom ; and it progressively come on Gnome for 3.4 , ( a first one exist on 3.2 shipped with 11.10 ). For sure next year life on Linux will be improved for digital graphic tablet owner. it keeps making mistakes when ever i accidentally place my hand on the tablet. Quand je fais twinview avec nvida-settings, les deux ecrans sont considerer comme screen number 0, du coup je peux pas mapper la cintiq a un seul ecran. Comment ta fais pour que l'un soit l'ecran 0 et l'autre 1? @lionbeast : Mes deux écrans sont aussi en ID '0' sous nvidia-settings ; mais le driver linux wacom ( version récente, prise dans les ppa ) fais le distingo. xsetwacom set "Wacom Cintiq 21UX stylus" MapToOutput "HEAD-1"
change bien d'un écran à l'autre. Ici, HEAD-0 semble être mon ecran primaire ( Cintiq ) et HEAD-1 mon secondaire. C'est un peu empirique, mais ça fonctionne. En tout cas merci pour tout ce que tu fais. c'est grace a toi que j'ai oser m'aventurer avec ma cintiq sur linux^^. @lionbeast : Bon courage, et merci pour ce retour. Ca fait plaisir de se sentir utile. 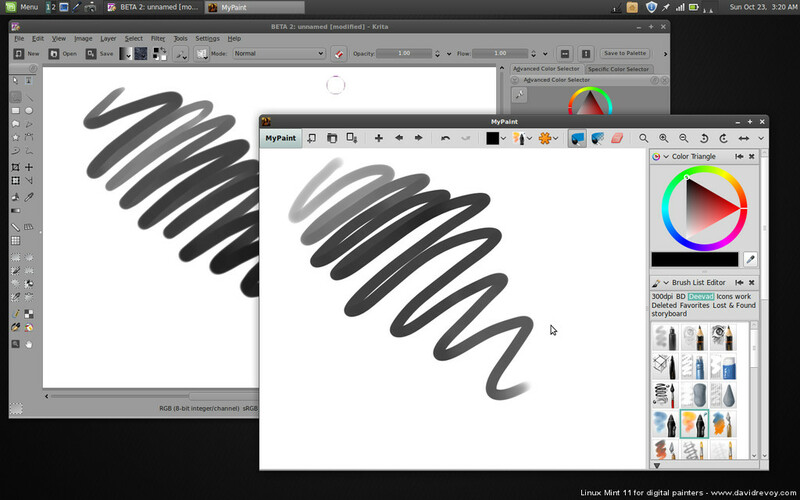 Juste un point : fait attention sous Oneiric : Gimp en version 2.6 et Gimp-painter ne fonctionneront pas avec la tablette pour dessiner ( bug de lignes qui saute à x=0 et y=0 ) et comme les dev d'Ubuntu s'en moque malgrès les centaines de protestations et reporte la faute sur la team Gimp qui elle a fixé pour les version 2.7 et plus ; cela tue la version 2.6. Juste pour l'info. Ca explique peut-etre pourqoui gimp rame autant, j'arrive a dessiner, mais le trait ne suis pas. J'ai toujours mypaint et photoshop sous wine aussi, donc je suis pas completement bloqué, mais c'est bon a savoir. Thanks for this David. Was wondering if you have tested Mint 12 yet to see if they Wacom / GIMP bug is still present? @Jason : Hi Jason, unfortunately I tested it ( some weeks ago, not very actual tests ) and it's well based on Oneiric, so the bug is still here and won't be corrected. Ubuntu team said it's a Gimp 2.6 problem , and Gimp team said they 'll not continue to support 2.6. I'm planning for my next system to move to another distribution ; Fedora maybe. But for the moment , I run LM11 on all my pro computers. When library will start to be too old to compile some new stuff ( ex ; GTK3 Gimp ) , I ll move. J'ai trouver ça super! j'ai fait ça sur mint apres la dernière Ubuntu 11.10 sans certaine chose ensuite j'ai voulus tester la dernière mint... et la plus de gimp (dev)... Donc ma question est cela fonctionne chez toi? Car même après retour sur Ubuntu 11.10 rien. al.chemy lives somehow...^^ a nice app for random sketching. configure: error: Test for GLIB failed. See the file 'INSTALL' for help. I keep getting this prompt the moment I try to install the "not buggy compiz"..."Unable to locate package compiz-fusion-plugins-unsupported". Is this suppose to be a local file? I only have one tiny question... After I do everything I need to do in the source-to-compile folder, can I delete it's contents? David, I think the era was in me using LinuxMint 12? I installed 11 and so far the install is going well...I'm at the "qtconfig" portion of the install. Will let you know how it works. I was a little surprised to see you have to configure your wacom with each use? In the mean time I contacted Hajime Mizuno , the maintainers of Gimp-painter ppa, to encourage to apply the patch to the version for Oneiric ( no answer for the moment since month ). Linux Mint 12 have a particular way to handle Gnome 3 ; wasting also a lot of vertical space with 2 bars... Gnome 3 is still also beta and offer not so much of comfort in customization and for professional workflow than Gnome 2 ; and I heard Mate ( the gnome 2 fork integration ) is buggy. I'm studying seriously the KDE desktop and Gnome 3 ; over a Fedora base ; a Opensuse base and a Linux Mint debian edition on a virtual manager. For the moment, I like the KDE Fedora spin. 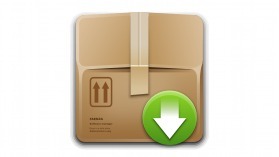 @Panda : Don't delete it ; I believe some part of the install are still running in this folder. But I'm not expert on this point. @David REVOY : Thanks for the response. I'm completely new to LinuxMint and that's only because of this extremely well laid out setup you have provided. I'm an open source supporter, but being a novice to Linux, I've had hard times setting up the OS/Hardware profiles. I've always used Fedora and and feel far more comfortable there, so I'm excited to hear that Fedora has a spin that is grabbing your attention...I would really like to have this type of "support" with Fedora. David, I also forgot to mention. I keep getting 2 updates for gimp. Should I ignore them? If so, why? Hi David. I have 2 questions. First: In Ubuntu/Linux Mint there is a any script, .tar.gz pack or anything that able to use the wacom with dA Muro (the drawing application of Deviantart site)? And second: Steps to configure the Wacom Intuos 5 is same that Intuos 4, or is a different process? Thanks for read my questions. And you need more art to deviantart. I want to see something new in your gallery. @Itzcuauhtli : Hi, first this page for the Linux Mint 11 concern only this outdated version, and it's not compatible with recent Linux Mint or Ubuntus ; it would be like following a Windows 3.1 tutorial for Windows 7. Second, DA Muro is a proprietary application. Even if you can access free, you can't access to code. So, it's the responsability to D.A to answer your problem, not mine or Linux developpers. 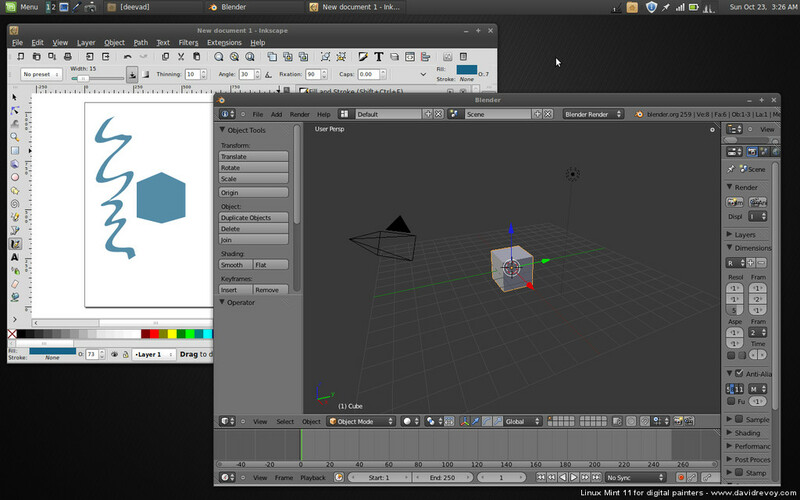 Third, driver for Intuos 5 where just done for Linux. To use them you will have to grab the source on Linux Wacom and compile them. Many thanks to share all that stuff. Compare to you, I m realy a lazy guy. Hello :-) I hope it's okay to post this here, with my question being about configuring a tablet. The Mint 19 beta (Cinnamon) doesn't have pressure sensitivity (for Ugee 2150) ... it may be a bug that'll be fixed before final release, but I'm panicking incase not. I saw that you used Manjaro, and wondered if I may please ask how to make Manjaro see my device and have pressure sensitivity. I'm sorry but I'm no good at any tech, and get overwhelmed with it. If I could ask what to install and the basic code to copy/paste, I would be more than grateful. Thank you for your time. I'm not using Manjaro right now. I'm using Kubuntu 17.10 (end of life, Jully 2018). I'll certainly move to KDE Neon 18.04 ; or Kubuntu 18.04 at the start of sumer after ep26. About Ugee I have no idea; I don't own this device. Have you reported the issue to Mint developers?